Do you know that if you trim your hair during the new moon waxing phase, that it will make your hair grow back 2 to 3 times faster? Yes, the moon can have a major impact on hair growth! The concept of cutting your hair to stimulate growth is a concept that does not make sense to some of you reading this, however in life not everything will make sense to you. It does not have to make sense in order for it to work. You cannot lean to your own understanding, sometimes just accept and believe by faith that a thing is true and that it will work for you. The concept of using the moon phases to create increase is not a new one, since biblical times man has used the moon to tell them when to plant, trim and fertilize crops. The same concept which farmers use to reap a bountiful harvest can also be applied to increase hair growth and thickness. I started doing new moon energy trimming last year. I did my first new moon trim, August 17th, 2013. I cut two inches from my bangs, and in 35 days my hair grew 1 and 3/4 inch. In only 35 days my hair grew back almost all of what I cut off. Amazing! How much increase one receives will vary, but if you do it on the right days, you will certainly receive increase above your normal rate of hair growth. No, you can do it one time, and that is just as effective. I believe you can get results up to 6 months after your trim. I did! Remember in order to know if your growth rate has increased you must know what your normal rate of growth. The only way to know for sure is to try it and keep an accurate record of your growth increase, every 40 days. For accuracy it helps to measure in the same area each time and also keep the hair in the same condition each time you measure. 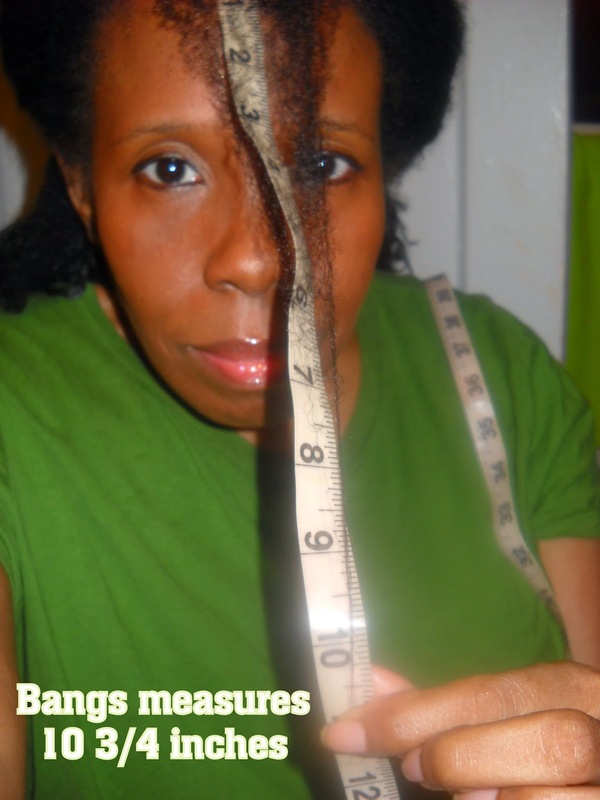 If you did your first measurements on stretched hair then remember to stretch your hair when you do your follow up measurements after 40 days. Accuracy is key! Very simple method, no pills, no creams just a trim! Simply trim your hair during the right days of each month and you will receive more growth increase than what you trimmed. Trimming your ends is essential to healthy hair. You should trim your hair 3 times a year, this would be during every 4th month. If your trim schedule begins in January, then you will cut your ends in April, August and December. Whichever month you start just count up towards every 4th month. Then find the best days to cut your hair within that month. How do I pick my New Moon Growth dates? Why are my dates the best dates? If you do a search you will find several sources giving out new moon dates for hair growth increase, and you will see that each sources dates vary slightly. I know my dates work. I pick my dates by using the Lunar calendar, to see the phases of the moon within the current month. You do not simply cut during the New Moon phase but it has to be on the right New Moon date. My dates work because I rely on Spiritual discernment from the Holy Spirit in picking the days, I refer to you. Whether you are a Believer or not, I know to whom I consult with, and I have done so since the first time I recall trying this method. To pray about it seemed natural. Through prayer and meditation I am given the best days and so I share them with whomever is willing to receive them, take advantage of this information now, it will get to the point in which I only share my dates with my subscribers. But right now they are open to anyone who reads my articles. 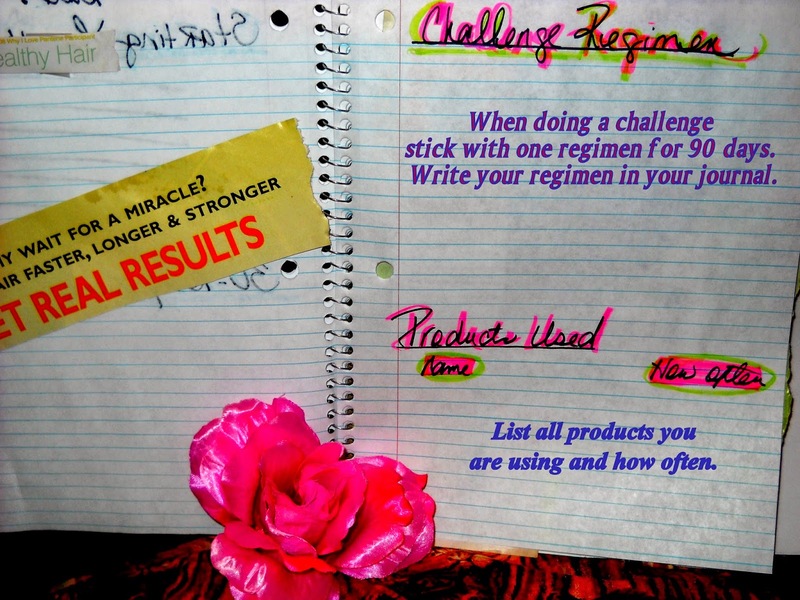 Try the 40 day New Moon Trim challenge for yourself! Pick your date, trim your hair, write it down, care for your hair and remeasure after 40 days. Growth increase will continue so continue to measure your increase every 30 days after your forty day mark. Keep a growth journal of your progress. Join the challenge leave your comments and questions below. 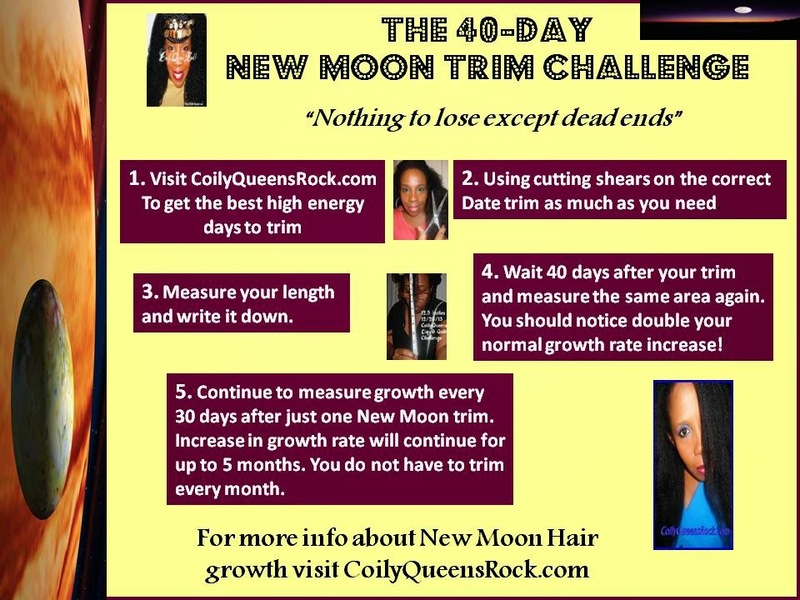 Leave your comment below if you are doing the 40 day new moon trim challenge. Write down your starting length after you trim then comeback in 40 days and let me know how much hair growth you received. Over the past year I have done 3 New Moon trims and it has helped me to grow 7 inches of new hair. Normally I receive 3 inches per year. Remember to only compare your progress with your own rate of hair growth. Try it for yourself the only thing you have to lose are those dead ends. Your ends are dry due to the manipulation of your hair cuticle from the straightening. Straightening the hair take all of the moisture from the hair and this disrupts your hair cuticle. You applied moisture to get it back curly and your coils came back due to the moisture. This is a sign that your hair does not like the pressings it is receiving and doing so may lead to damage. Can't wait for my results. I just trimmed today and took a pic of my hair afterwards. When would be the best time to do my first trim in april 2016? Sorry this is an old post from last year. The August dates are posted here to. Scroll through the recent articles or do a search for August new moon phase dates in the search bar for this site. Thank you for reading my blog!